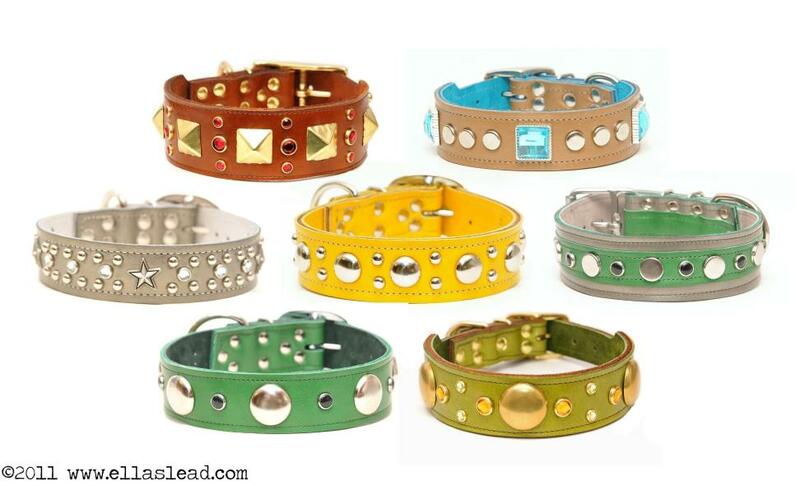 These leather collars are special because they come in a variety of different colors and because they are cut, glued, and stitched onto thicker leather or inner/suede combo. Some of these leathers will be textured and some will have patterns. These leathers are thinner cowhides, but have every bit of the quality of our regular leather collars. In fact, such quality that our friends at Collar Mania used to make and sell them. But since experiencing a few health issues, and wishes to go in another direction, Ella's Lead is now taking over the line and making it our own. These can be lined in a nice suede or by themselves. Or, if you'd prefer, they can be stitched to just a strap of high quality leather. ***For stitching color: No, we don't offer the color option, yet. To make things easiest on us, we are going to best match the thread color to your collar. IF you have a special thread color request, please put it in the "additional design instructions/questions" box. But do know that we have: Red, black, white, green, pink, brown, tan, and lilac purple. Stitching will only really "pop" on a collar, or be noticeable, if the color of the thread is a color that completely contrasts with the color of the leather. ***FOR NECK SIZES: If your dog's neck size falls between two collar range sizes, choose the next size up, and put your dog's neck size in the required field on the menu. We will size it appropriately. Thank you!